Antiproliferative agent (IC50 values are 8,13 and 18 μM for K562, CML-CP and CML-BC cells respectively). Inhibits H/R-induced PTK activation. Induces G(2)/M cell cycle arrest and mitochondrial transmembrane potential drop. Modulates MAPK/ERK/JNK and JAK2/STAT3 /AKT signaling. Inhibits PPAR-g. Modulates differentiation. Inhibits cytochrome P450 in vivo. Orally active. Cardiovascular function improvement, hormone regulation and antitumor activity. 2. The anti-MM activity of Icaritin was mainly mediated by inhibiting IL-6/JAK2/STAT3 signaling. 3. 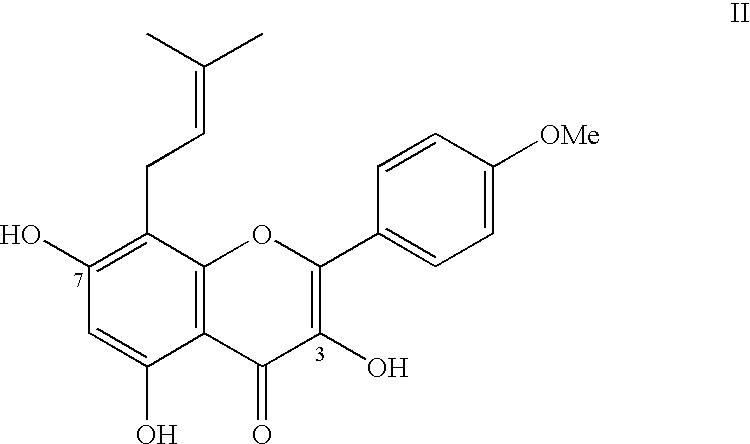 The inhibitory activity of Icariside II on pre-osteoclast RAW264.7 growth was synergized by Icaritin, which maybe contribute to the efficiency of Herba Epimedii extract on curing bone-related diseases, such as osteoporosis. 4. The Icaritin at low concentration (4 or 8 μmol/L) can promote rat chondrocyte proliferation and inhibit cell apoptosis, while the effect of Icaritin on rat chondrocyte at high concentration was reversed. 5. Icaritin might be a new potent inhibitor by inducing S phase arrest and apoptosis in human lung carcinoma A549 cells. 6. 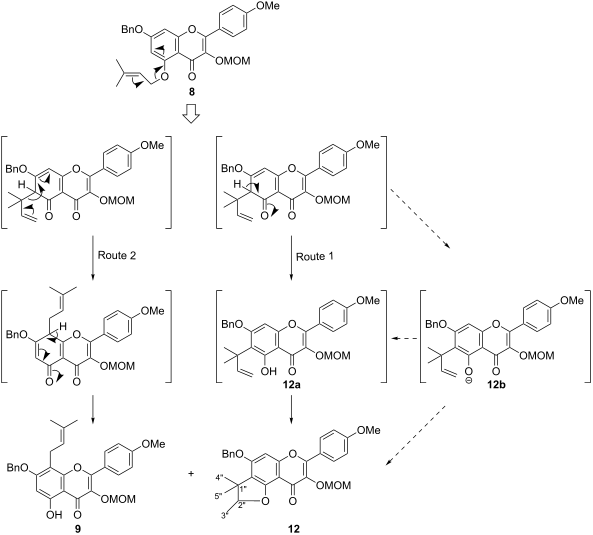 Icaritin dose-dependently inhibits ENKL cell proliferation and induces apoptosis and cell cycle arrest at G2/M phase. Additionally, Icaritin upregulates Bax, downregulates Bcl-2 and pBad, and activates caspase-3 and caspase-9. Herba epimedii (Epimedium, also called bishop’s hat, horny goat weed or yin yang huo), a traditional Chinese medicine, has been widely used as a kidney tonic and antirheumatic medicine for thousands of years. It is a genus of about 60 flowering herbs, cultivated as a ground cover plant and an aphrodisiac. The bioactive components in herba epimedii are mainly prenylated flavonol glycosides, end-products of the flavonoid pathway. Epimedium species are also used as garden plants due to the colorful flowers and leaves. Most of them bloom in the early spring, and the leaves of some species change colors in the fall, while other species retain their leaves year round. The herbs we used to extract icariin is one species of Epimedium, which name is Epimedium brevicornum Maxim. This kind of epimedium only can be abundantly found in Gansu province of China. And because of the growth habit of this kind of herb, which only grows under trees, it can’t to be planted, only can harvest the wild one. This wild epimedium contains quite a bit of active components, depending on its long growth time and rich nutrient. Usually the content of the icariin is not lower than 1%. Below photo is the herb specimen which we use. Picking in the epimedium full-bloom stage. And the medicinal value of the herb is the best at this time. The herb we select contains roots, stems, leaves and flowers. And we extract with the whole herb. Epimedium extract is a herbal supplement claimed to be beneficial for the treatment of sexual problems such as impotence. It is believed to contain a number of active components, including plant compounds that may have antioxidant activity and estrogen-like compounds. The major components of Epimedium brevicornum are icariin, epimedium B and epimedium C. It is reported to have anti-inflammatory, anti-proliferative, and anti-tumor effects. It is also reported to have potential effects on the management of erectile dysfunction. 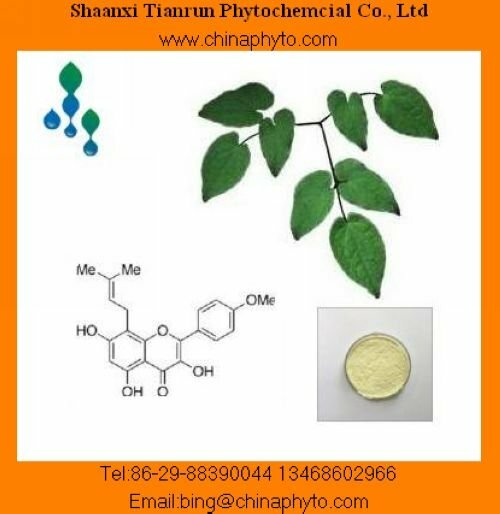 The plant extracts of epimedium traditionally used for male impotence, and the individual compounds is icariin, were screened against phosphodiesterase-5A1 (PDE5A1) activity. Human recombinant PDE5A1 was used as the enzyme source. The E. brevicornum extract and its active principle icariin were active. 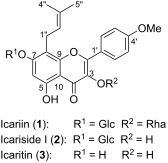 To improve its inhibitory activity, some derivatives ware subjected to various structural modifications, which include icaritin, icariside II and 3,7-bis(2-hydroxyethyl) icaritin. There have some scientific papers report that the improved pharmacodynamic profile and lack of cytotoxicity on human fibroblasts make such compounds a promising candidate for further development. We hope that our new products can help you to find more commercial opportunity. In this way, we can introduce those products as below, and we can also provide more details about the products according to your demand. 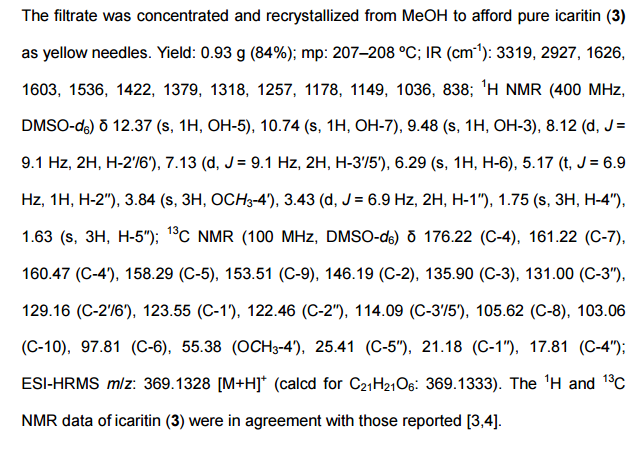 The 1H-NMR of icaritin and 3,7-bis(2-hydroxyethyl) icaritin is as below. Product Name Specification CAS No. Epimedium has been used to treat male erectile dysfunction in Traditional Chinese Medicine for many centuries. The main functions of Epimedium brevicornum in ancient Chinese books focused on the nourishment of kidney viscera and reinforcement of ‘yang’, resulting in the restoration of erectile function in males. Epimedium contains chemicals which might help increase blood flow and improve sexual function. It also contains phytoestrogens, chemicals that act somewhat like the female hormone estrogen that might reduce bone loss in postmenopausal women. Figure 1: Structures of icariin (1), icariside I (2) and icaritin (3). Scheme 1: Reagents and conditions: (a) Ac2O, pyridine, 94%; (b) BnBr, KI, K2CO3, acetone, 85%; (c) Me2SO4, K2CO3, acetone, MeOH, 82%; (d) MOMCl, N,N-diisopropylethylamine (DIPEA), CH2Cl2, 93%; (e) 3,3-dimethylallyl bromide, 18-crown-6, K2CO3, acetone, 86%; (f) Eu(fod)3, NaHCO3, PhCl, 85 °C, 61%; (g) MeOH, 3 M HCl (aq), reflux, 95%; (h) Pd/C, 1,4-cyclohexadiene, MeOH, 84%. Scheme 2: Decomposition of 8. Scheme 3: Claisen rearrangement of flavonol 8. Scheme 4: Reagents and conditions: (a) 15, DMF/CHCl3, Ag2CO3, molecular sieves (4 Å, powder); (b) 16, CH2Cl2, Ag2O, molecular sieves (4 Å powder), 31% for 2 steps; (c) NH3 (g), MeOH, 94%; (d) NH3 (g), MeOH, 63% for 2 steps. 3 Nguyen, V.-S.; Shi, L.; Li, Y.; Wang, Q.-A. Lett. Org. Chem. 2014, 11, 677–681. 4. Dell’Agli, M.; Galli, G. V.; Dal Cero, E.; Belluti, F.; Matera, R.; Zironi, E.; Pagliuca, G.; Bosisio, E. J. Nat. Prod. 2008, 71, 1513–1517. The present invention relates to compositions comprising icariside I, and to a novel, one step method of preparing such compositions, comprising converting specific prenylated flavonol glycosides such as epimedium A, epimedium B, epimedium C, icariin, and their corresponding acetate derivatives contained in an Epimedium plant extract to a single compound, namely icariside I shown below as compound I, which was surprisingly discovered to be a strong PDE-5 inhibitor. This invention further comprises compositions enriched for anhydroicaritin, and to methods of preparing such compositions. 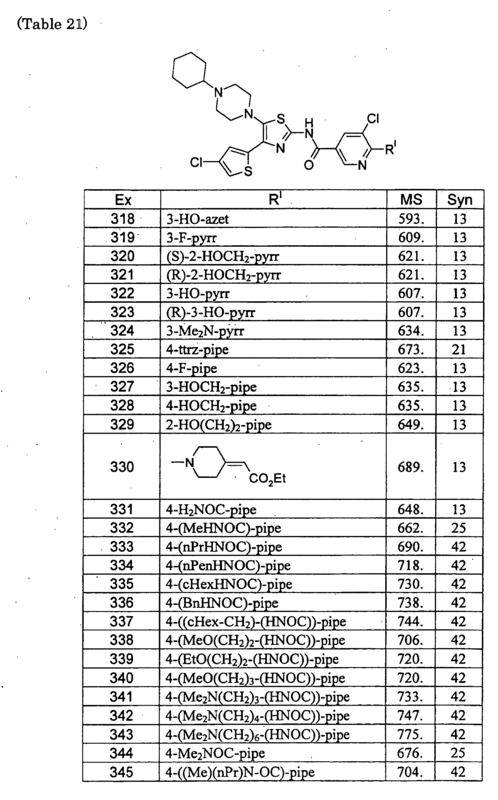 One method of this invention for preparing compositions enriched for anhydroicaritin comprises a one-step method of converting prenylated flavonol glycosides, specifically the sagittatoside compounds A, B, and C, and the corresponding acetate derivatives, present in Epimedium plant extracts to a single compound, namely anhydroicaritin shown below as compound II, which was also discovered to be a strong PDE-5 inhibitor. EXAMPLES Example 1 Acid Hydrolysis of a 50% EtOH Extract and Purification by Reversed Phase ChromatographyWhole Epimedium grandiflorum leaves were extracted with a 1:1 mixture of ethanol and water at 55° C. The resulting extract (referred to as a “50% EtOH extract”) was filtered and the filtrate concentrated at 40-50° C. under vacuum and then dried under vacuum at 60° C. to a dry solid. The dried extract (131 g) containing approximately 5.8 g of total PFG’s was placed in a 2 liter round bottom flask and 1 L of 90% ethanol was added. The mixture was heated to reflux to help dissolve the solids. Concentrated sulfuric acid (28 mL) was added. The mixture refluxed for 2 hr, cooled to room temperature, and 900 mL of water added with stirring. Next the mixture was filtered using vacuum to remove insoluble sulfate salts and other solids and loaded on a 2.5×56 cm (275 mL) column packed with 250-600 micron divinylbenzene cross-linked polystyrene resin (Mitsubishi Chemical). The column was washed with 2 column volumes (CVs) of 60% ethanol and the icariside I was eluted with 2 CVs of 95% ethanol. The product pool was air-dried producing 11.3 g of brown solids. 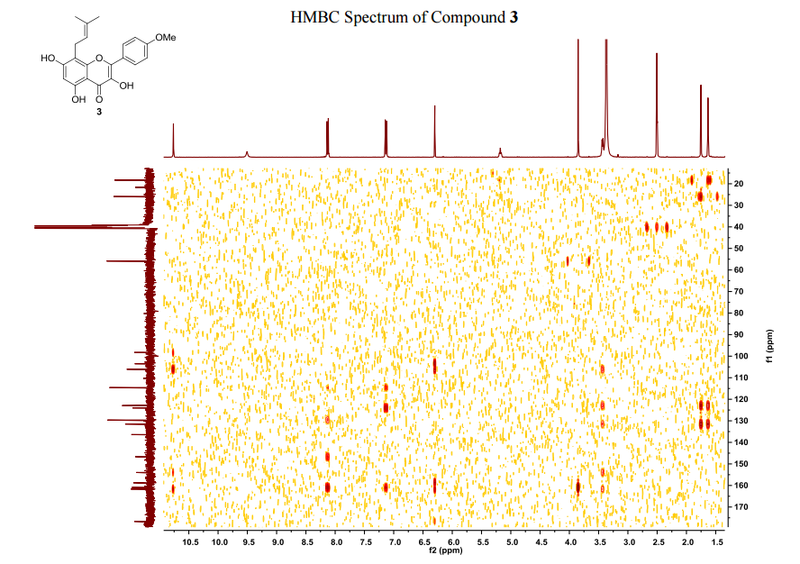 HPLC analysis (FIG. 5) showed that the solids contained 18% icariside I (peak 15.27 min) and 12% anhydroicaritin (peak 25.15 min). The recovery of the icariside I in the product pool was 87% of the amount present in the hydrolyzate. Example 2 Purification of a Hydrolyzate by Liquid/liquid ExtractionThe ethanolic hydrolyzate (25 mL) prepared in Example 1 was mixed with 62.5 mL of de-ionized water and the pH was adjusted to 7.0 using 50% (w/w) sodium hydroxide solution. The resulting mixture was extracted with three 25 mL portions of ethyl acetate and the combined ethyl acetate extracts were back extracted with 150 mL of water. 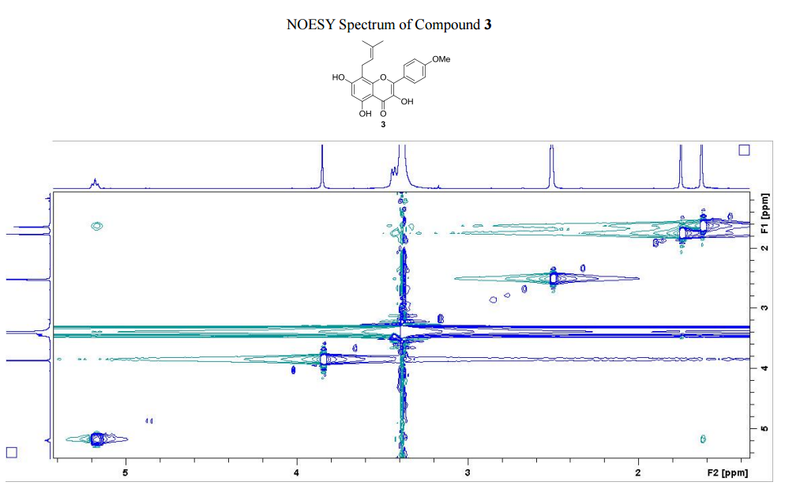 The ethyl acetate layers were combined, dried, and assayed for icariside I. HPLC analysis (FIG. 6) showed that the dried EtOAc fractions contained 22% icariside I (peak 15.29 min) and 11% anhydroicaritin (peak 25.27 min), and icariside I recovery into the ethyl acetate was 97% of the amount present in the hydrolyzate. The partition coefficient for icariside I between ethyl acetate and water was found to be 16, indicating that the icariside I has a high affinity for ethyl acetate over water. Example 3 Acid Hydrolysis of a 50% EtOH Extract and Purification by PrecipitationThe dried extract (204 g) described in Example 1 was mixed with 1 L of 90% EtOH and then heated to reflux to help dissolve the solids. Sulfuric acid (25 ML) was added slowly with swirling. The mixture was refluxed 90 minutes and immediately chilled to stop the reaction. After cooling to room temperature, the mixture was filtered under reduced pressure through cellulose paper to remove insoluble sulfates and other materials, and the cake was washed with about 350 mL of 90% ethanol. The resulting ethanolic hydrolyzate (1.34 L) contained 4.1 g of icariside I. The ethanolic hydrolyzate prepared above (1.32 L) was placed in a 10 L container and 40 g of 50% (w/w) sodium hydroxide solution was added followed by 20 mL of phosphoric acid. Next 3.3 L of deionized water was added with stirring. The pH of this mixture was 2.4. Sodium hydroxide solution (50% w/w ) was added until the pH was 8.25. The mixture was heated to 65° C. to assist with the coagulation of the precipitate. The mixture was cooled to room temperature and stirred for 0.5 hr at room temperature before filtering through a cellulose filter using vacuum. The resulting brown solids were washed with 715 mL of 10% ethanol and dried either under vacuum at room temperature or in air at 55° C. to yield brown solids. 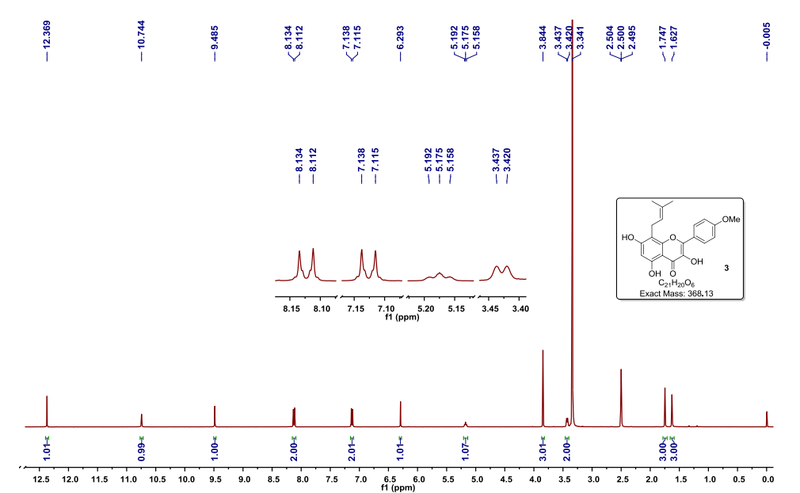 HPLC analysis (FIG. 7) showed the solids contained 20% icariside I (peak 15.27 min) and 10% anhydroicaritin. Recovery of icariside I using this precipitation procedure was 94% of the amount present in the hydrolyzate. Example 4 Acid Hydrolysis of a Water Extract and Purification by PrecipitationGround Epimedium grandiflorum leaves (0.40 kg) were mixed with 5 L water in a 10 L round bottom flask. The flask was placed on a rotary evaporator for two hours at a rotation speed of 120 rpm and a water bath temperature of 90° C. The extract was filtered under reduced pressure through cellulose paper. The resulting filtrate (3.2 L) was evaporated using the rotary evaporator to a volume of 100 mL and dried under vacuum at 50° C.
The dark brown solids prepared above (40.4 g) were mixed with 200 mL of 90% ethanol and 6.0 mL of sulfuric acid in a 500 mL round bottom flask. The mixture was refluxed for 90 minutes and immediately chilled to stop the reaction. This mixture was filtered under reduced pressure through cellulose paper to remove insoluble sulfates and other materials. The cake was washed with 15 mL of 90% ethanol. The resulting ethanolic hydrolyzate (215 mL) contained 0.53 g of icariside I. The hydrolyzate prepared above (50 mL) was transferred to a 250 mL beaker and 2.5 mL of 50% (w/w) sodium hydroxide solution was added with stirring to adjust the pH of the solution to pH 9, followed by 1.5 mL of concentrated phosphoric acid. Deionized water (125 mL) was added, and the mixture was adjusted to pH 8.2 using 1.5 mL of 50% sodium hydroxide solution. The mixture was heated to 65° C. to assist with coagulation of the precipitate and cooled to room temperature. The mixture was allowed to sit undisturbed at room temperature for 30 minutes prior to filtration under reduced pressure through cellulose paper. The resulting olive-green solids were washed with 25 mL of de-ionized water and dried under vacuum at room temperature or in air at 80° C. to produce olive-green solids. HPLC analysis (FIG. 8) showed the solids contained 60% icariside I (peak 15.33 min) and 2.4% anhydroicaritin (peak 25.40 min). Recovery of icariside I using this precipitation procedure was 92% of the amount present in the hydrolyzate. Example 5 Enzymatic Hydrolysis of Icariside Ia) The substrate was a partially purified icariside I product with 20% icariside I and 11% anhydroicaritin. About 50 mg was dissolved in 10 mL of ethanol, and water or buffer was added until the mixture became cloudy (about 20% ethanol). The following dry enzymes were added to separate samples: α-amylase, α-glucosidase, β-amylase, β-glucosidase, hesperidinase, lactase, and pectinase. The samples were incubated overnight at 40 ° C. and analyzed by HPLC. The results were only semi-quantitative due to the difficulty in dissolving the anhydroicaritin that precipitated from the samples. 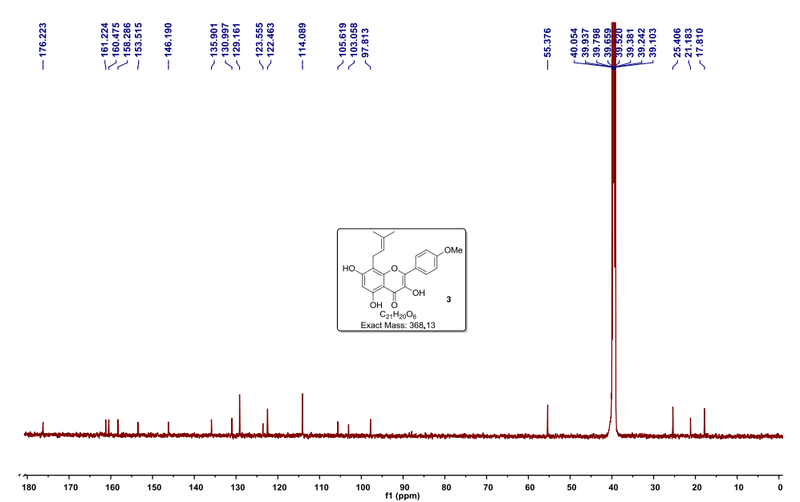 However, several of the chromatograms did show a definite reduction in icariside I and increase in the ratio of anhydroicaritin to icariside I. The best results were obtained using hesperidinase, lactase, β-glucosidase and pectinase. A larger scale experiment was done using hesperidinase in order to isolate pure anhydroicaritin for characterization. Pure icariside I (20 mg )was dissolved in 10 mL of ethanol and 50 mL of water and 200 mg of hesperidinase enzyme was added and the mixture was incubated for 24 hr at 40 ° C. Crude anhydroicaritin was collected via filtration and purified on a 2.5×30 cm semi-prep C-18 HPLC column using a gradient of 50:50 (MeCN/H2O) to 80:20 (MeCN/H2O) in 20 min. The pure anhydroicaritin was analyzed by LC/MS and proton NMR. b) Enzymatic Hydrolysis of PFG’s: The purified PFG solids (55.3%, purified by reversed-phase chromatography of a 50% EtOH extract) were subjected to enzymatic hydrolysis with the same enzymes and conditions described in part (a). 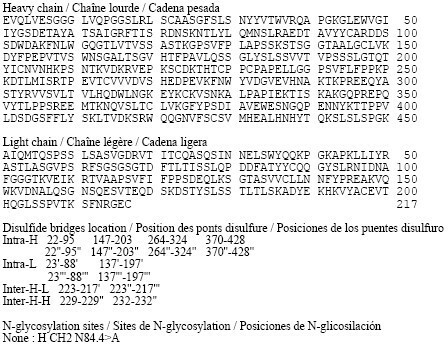 Hesperidinase, lactase, β-glucosidase and pectinase appeared to convert the mixture of PFG’s to a mixture of sagittatosides, but no icariside I or anhydroicaritin were observed. 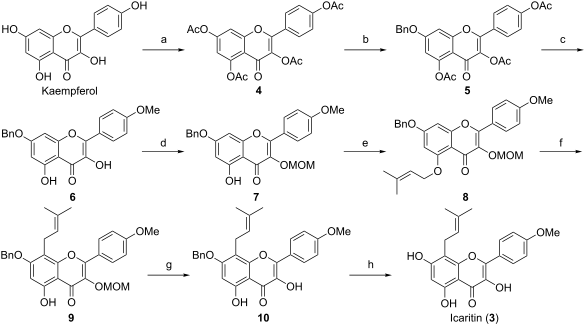 This indicated that these enzymes were specific for the 7-β-glucosyl group and did not hydrolyze the 3-position sugar(s). Example 6 Preparation of a High Anhydroicaritin-containing ProductA high sagittatosides Epimedium sagittatum extract containing 24.7% total sagittatosides (assayed as icariin) and 8.1% icariin and other expected prenylated flavonol glycosides was obtained from China. A 50 g portion of this extract was mixed with 250 mL of 90% ethanol and 7.5 mL of concentrated sulfuric acid in a 500 mL round bottom flask. The mixture was refluxed for 90 minutes, then allowed to cool to room temperature. The hydrolyzed mixture was filtered under reduced pressure through cellulose paper to remove insoluble sulfates and other materials. The cake was washed with approximately 20 mL of 90% ethanol. The resulting filtered ethanolic hydrolyzate (305 mL) contained 3.75 g of anhydroicaritin and 2.50 g of icariside I. The filtered hydrolyzate prepared above (200 mL) was transferred to a 1000 mL container and 8.0 mL of 50% (w/w) sodium hydroxide solution was added with stirring, followed by 4.0 mL of phosphoric acid. De-ionized water (500 mL) was then added. This mixture was adjusted to pH 4.9 using 50% sodium hydroxide solution. The mixture was allowed to sit undisturbed at room temperature for 24 hours prior to decanting off the liquid. The resulting solids were macerated using de-ionized water and filtered under reduced pressure through cellulose paper. The resulting dark brown solids (11.9 g) were washed with de-ionized water and dried in air overnight. The dark brown solids contained 20% anhydroicaritin and 12% icariside I and an anhydroicaritin/icariside I ratio of 1.66. The recovery of anhydroicaritin in the precipitation procedure was 94% from the hydrolyzate. Example 7 Recrystallization of Icariside IIcariside 1 (30 mg) obtained by a method described in Example 1 was dissolved in a minimum of hot tetrahydrofuran (THF). Hot methanol (approximately 10 mL) was then added. The hot THF/MeOH solution was filtered through a PTFE filter into a vial and allowed to evaporate at room temperature to about 5 mL, whereupon crystals began to form, and then placed in a 4° C. refrigerator for 24 hours. The crystals were filtered and washed with cold methanol and dried in a vacuum. Icariside I (21 mg) was isolated as yellow crystals and had a chromatographic purity of 97.4%. Example 8 Large Scale Acid Hydrolysis of an Epimedium extractAn 800 g portion of an Epimedium sagittatum powder extract obtained from China containing about 13% total prenylflavonol glycosides as icariin was mixed with 4.0 L of 90% ethanol and 120 mL of sulfuric acid in a 10 L round bottom flask. The mixture was refluxed for 90 minutes and immediately chilled to stop the reaction. This mixture was filtered under reduced pressure through cellulose paper to remove insoluble sulfates and other materials. The cake was washed with approximately 200 mL of 90% ethanol. The resulting ethanolic hydrolyzate (4.0 L) contained 33.7 g of icariside I. The ethanolic hydrolyzate prepared above was transferred to a 34 L container and 200 mL of 50% (w/w) sodium hydroxide solution was added with stirring, followed by 120 mL of phosphoric acid. De-ionized water (10 L) was then added. This mixture was adjusted to pH 8.2 using 120 mL of 50% sodium hydroxide solution. The mixture was stirred for 10 minutes and allowed to sit undisturbed at room temperature for 60 minutes prior to filtration under reduced pressure through cellulose paper. The resulting olive-green solids were washed with 750 mL of de-ionized water and dried under vacuum at 50° C. or in air at 80° C. The olive-green solids contained 44.6% icariside I. Recovery of icariside I in the precipitation procedure was 96% from the hydrolyzate. Example 9 Large Scale Purification of an Epimedium Extract Containing Prenylflavonoid GlycosidesA 3.7 kg portion of an Epimedium sagittatum powdered extract obtained from China containing approximately 10% total prenylflavonol glycosides (PFG’s) assayed as icariin was stirred with 35 L of 85/15 acetone/water (v/v) in a 50 L mixing tank. The mixture was stirred vigorously for 30 minutes and allowed to sit for 5 minutes. The acetone extract layer (36 L) was decanted from the tank and contained 362 g of PFG’s. Recovery of the PFG’s in this extraction procedure was 96%. A portion (about 500 mL) of the acetone extract was dried under reduced pressure at 50° C. or less, providing 16.1 g of brown solids which were analyzed to contain 28.6% total PFG’s when assayed as icariin. tested was the butanol fraction. the aqueous fraction of the liq/liq extraction. By DR ANTHONY MELVIN CRASTO Ph.D in cancer, cfda, china pipeline, CHINESE HERBS, FAST TRACK FDA on September 21, 2015 .